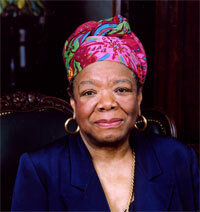 Maya Angelou is hailed as one of the great voices of contemporary literature and as a remarkable Renaissance woman. A renowned poet, educator, historian, best-selling author, actress, playwright, civil rights activist, producer and director, Dr. Angelou travels the world spreading her legendary wisdom. A mesmerizing vision of grace, swaying and stirring when she moves and talks, Dr. Angelou lyrically captivates her audiences with her unique brand of vigor, fire and perception. She has the uncommon ability to shatter the opaque prisms of race and class in a broad range of literary venues, both spoken and unspoken. Dr. Angelou's numerous books of poetry, non-fiction and fiction, as well as her autobiographical works and audio-visual presentations, are indicative of her extraordinary vision and unquestionable significance on the national and international scenes. Born in 1928, Dr. Angelou originally trained to be a dancer and an actress. 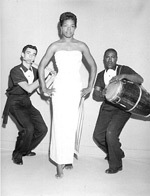 During the 1950s and 1960s, she appeared in a touring company of "Porgy and Bess," recorded an album of calypso music, and wrote plays and musicals. In 1970, urged on by James Baldwin and other friends who had heard her tell stories of her childhood, she published the autobiographical I Know Why the Caged Bird Sings. This work was a bestseller and was nominated for a National Book Award and a Pulitzer Prize. Its success launched her literary career, which now includes over twenty works of autobiography, poetry, fiction, and works for children. Dr. Angelou also appeared in the landmark miniseries "Roots" in 1977, and in 1998, she made her directorial film debut with "Down in the Delta." Her numerous awards and honors include the Alston/Jones International Civil & Human Rights Award in 1998; and the Writer's Digest Award in 1999, which named her one of the Top 100 Best Writers of the 20th Century, and the Presidential Medal of Arts in 2000. More than 30 of the nation's educational institutions have bestowed honorary degrees upon her. Others have named her to prestigious lectureships and presented her with distinguished academic honors. Other awards include the Distinguished Woman of North Carolina award in 1992, the Essence Woman of the Year award in 1992, and the American Academy of Achievement's Golden Plate Award in 1990. Dr. Angelou received a Tony Award Nomination for her performance in "Look Away" in 1973, an Emmy nomination for her performance in "Roots" and a Grammy award in 1994 for Best Spoken Word or Non-Traditional Album. In January 1993, Dr. Angelou became only the second poet in U.S. history to have the honor of writing and reciting an original work at the Presidential Inauguration. "On the Pulse of the Morning: The Inaugural Poem" was delivered at the first-term swearing-in ceremony of President William Jefferson Clinton. Dr. Angelou is the mother of one son.